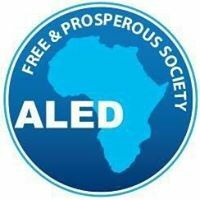 Having successfully started Students for Liberty chapters in a number of universities in Uganda Mugabi Socrates has now set up Action for Liberty and Economic Development, ALED which has been interacting energetically with a wider audience during 2018 its start up year. In the last 9 months Mugabi has spoken to children in Primary and Secondary Schools and the organization has run Entrepreneurship Forums and Women’s Entrepreneurship Forums and been involved in university seminars and debates throughout the country, as well as wider civic debates and packed meetings in their tiny offices. 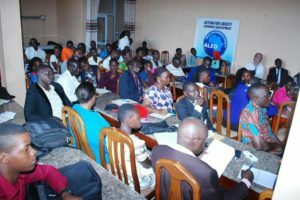 Mugabi won the Entebbe Young Activist Award for 2018 for his energetic and successful promotion of liberty. The venues and facilities may often be humble but their hard work and dedication in promoting a free and prosperous society in Uganda is second to none. They will have interacted with about 2000 people during the year and are inspiring increasing numbers to want to learn more and join them in their work. We had hoped that they would have all received a copy of the CD so that they could study the ideas in more depth but unfortunately the Uganda customs have confiscated the consignment we sent earlier this year although Mugabi is still working on getting them out. Through his Student for Liberty work they have a strong connection with universities and very recently Nkumba University has agreed a collaboration with ALED which is an important development for them because of the universities strong pool of intellectuals and scholars who will be able to help them with the researches needed to develop convincing market oriented solutions to Uganda’s economic and social problems.